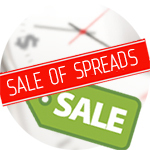 We are glad to inform you that a unique "Sale of Spreads" promo has been prolonged till 9th of August. This offer was warmly welcomed by our traders and meeting your numerious requests we prolonged its terms. Now you have two more weeks to save up to 50% of spread on the contracts with a high volatility. For the month of its work the most popular contract was GBPJPY pair – the highest volume was traded with this contract. Other leaders are EURGBP and Brent oil (#BRENT). Over recent months, named contracts had shown a better volatility than major pairs, therefore, their application opens big chances for earning. To participate in "Sale of Spreads" promo, you only need to find the most suitable contracts in the table and open trades on them within the period from 5 pm to 5 am, GMT . Choose the most suitable time for your trading and receive profit!